A herniated disc occurs when the spongy disc between your vertebrae that acts as a shock absorber, protecting the bones in your spine from bumping into each other, bursts or bulges from its healthy position. You may have heard the condition referred to as a slipped disc or ruptured disc. Although it is not always possible to prevent a herniated disc and the associated spine pain in Miami, there are things you can do to reduce your risk. Follow these steps to protect your back and lower your chances of having a herniated disc. When you are overweight, the excess weight puts a great deal of pressure on your spine. Over time, the pressure can cause the bones in your spine to squeeze the discs and cause damage. In turn, this can cause a disc to become herniated and press against the nerves in your back. This kind of wear and tear is common with age, but when you are overweight, it can happen much earlier in life. Maintaining a healthy weight reduces the pressure on your spine to keep your discs healthier. Further, if you exercise to maintain your weight, you will strengthen your back and cut your risk of having a disc herniation even more. You may not thinking smoking has anything to do with the health of your spine, but in reality, it is a significant risk factor for herniated discs. When you smoke, the nicotine you inhale interferes with the way your discs absorb nutrients. As a result, your spinal discs can be unnourished, dry, and brittle, making them much more prone to injuries and herniation. If you don’t smoke, don’t start, and if you do, ask your doctor for help quitting. 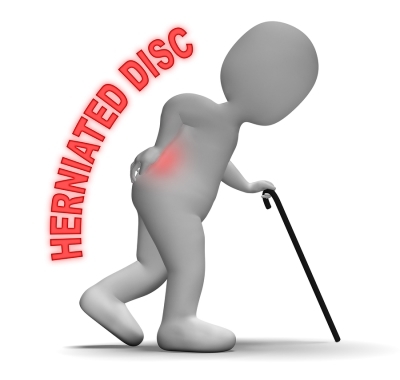 Many people experience an acute herniated disc through improper lifting. When you have to lift an item, bend at your knees, not your waist, and use your legs to push yourself up instead of your back. Never attempt to pick anything up without testing to see how heavy it is first, and if it weighs too much, get help.